I recently discovered a company that also makes 3mm Perspex organisers called SheWolf. It is a Durban based company that has a large selection of various storage units. It is always great as a consumer to have a good variety of products to choose from with varying pricetags. 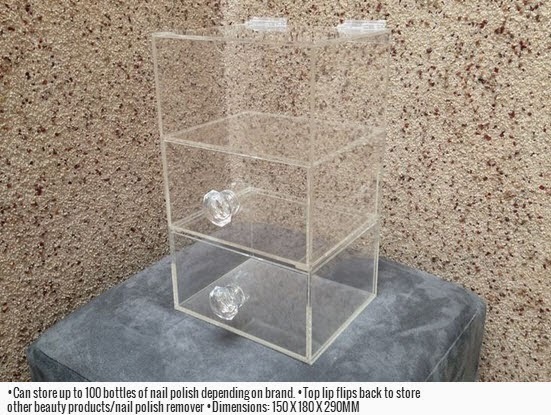 I personally have my eye on the nail polish storage unit that can store up to 100 bottles of nail polish. It would be so much better than the boxes I currently have them in and at R600 it is quite affordable because it can also be used to store other makeup goodies. There is such a great selection of various products that it won't be easy to cover them all in this post.